Show your celebration of this American League West professional baseball team with our Personalized Family Cheer Oakland Athletics premium sports wall art from PersonalizedThings by Exposures. 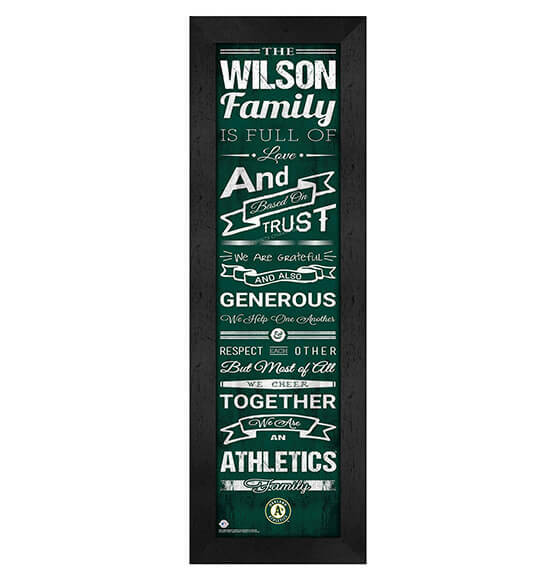 This quality MDF vinyl-wrapped sports decor highlights the Oakland A's team colors and logo in a vibrant print behind glass with a charming family-oriented saying that you'll hang proudly in your family room, living room or office. Ideal to purchase for yourself or as a gift for a family member, friend or co-worker, this vertical-hanging framed wall art will be a hit for anyone who loves the boys in green and gold.